No, it’s not a joke, and no, we don’t really hate mountains. “I Hate Mountains” is the name of a Left 4 Dead 1 & 2 campaign made by three French friends. Be aware that this campaign is built the Valve way, we are not trying to revolutionize anything, we just want to provide more content to this awesome game. The campaign is divided into five different maps, just like Valve did with their own campaigns in Left 4 Dead 1. The difference is that ours is entirely nature-oriented, there’s only a few building and most of the action takes place in outdoor environments, which is a challenge to build in itself. We also focused our development on offering a better re-playability by providing several long alternate paths in the levels that can totally change the way you play it. This is it! 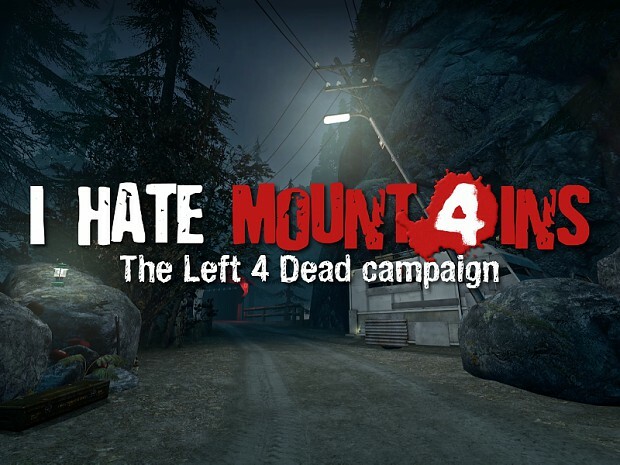 The Left 4 Dead 2 version of I Hate Mountains subtly dubbed I Hate Mountains 2! It certainly took time, almost 8 months... At the beginning, we honestly thought this port would be a piece of cake, but we just couldn’t figure how difficult it would be and how life would change for each of us following the release of the first version. Any computer that can run Left 4 Dead 2 campaigns should be able to run I Hate Mountains 2 decently. We'd recommend that your computer specifications slightly exceed what's recommended for Left 4 Dead since our campaign is a bit greedier in some places. How do I install this campaign? Valve definitely broke the custom particle engine in Left 4 Dead 2, there is no way to see our custom visual effects anymore. Everything should work straight out of the box, except a few missing sounds maybe. How do I uninstall this campaign? During the development, there's a few things we had to accept and among these is the fact that not everything is possible in a Left 4 Dead 2 campaign. Because of this, there's a few problems we are aware of but can't fix or didn't had the time to fix before release. Here's a little list just so you guys know what's going on. Tough work, guys, this will definitely make much fun!